These are a big hit at fiestas, and they also make a hearty afternoon snack. The meat filling can be made ahead if you like, then reheated as needed right before assembling the tacos. Once you’ve mastered the basic recipe, scroll down for a few scrumptious variations. If you are unable to find these appetizer-sized tortillas, you can make your own from about a dozen large corn tortillas. Use a biscuit cutter or a drinking glass that is 3 to 4 inches in diameter to cut 3 or 4 rounds out of each large tortilla. Place ground beef into a medium-sized saucepan over medium heat. Brown it, using a potato masher or other utensil to break up the meat into small crumbles. Once the beef is browned, drain off any excess fat. Add the tomatoes, powdered chile, oregano, garlic and onion powders, and cumin. Bring mixture to a boil, then reduce to a simmer until liquid has evaporated or been absorbed. Turn your oven to 400 Fahrenheit / 204 Celsius so that it can pre-heat. Use a pastry brush or your fingers to brush each side of the tortilla rounds with a little vegetable oil. Set tortilla rounds on a metal cookie sheet in a single layer. (You may need 2 cookie sheets for all the pieces to fit without overlapping.) Place a tablespoon of ground beef and a pinch of cheese on each tortilla. Fold over each piece in such a way as to form half-moon-shaped packets with the filling inside. Lightly press tortilla edges together. Bake your mini tacos for about 10 minutes, until tortillas start to brown. Serve immediately. Offer sour cream, guacamole, basic salsa, and your favorite Mexican table sauce (or more than one!) as a dip/condiment. If you prefer fresh ingredients to dried seasonings, you can substitute finely diced fresh onion and garlic for the dried versions in this recipe. Add them to the browned ground beef (once any excess fat has been drained off) and sauté briefly with the meat before adding the tomatoes and other ingredients. 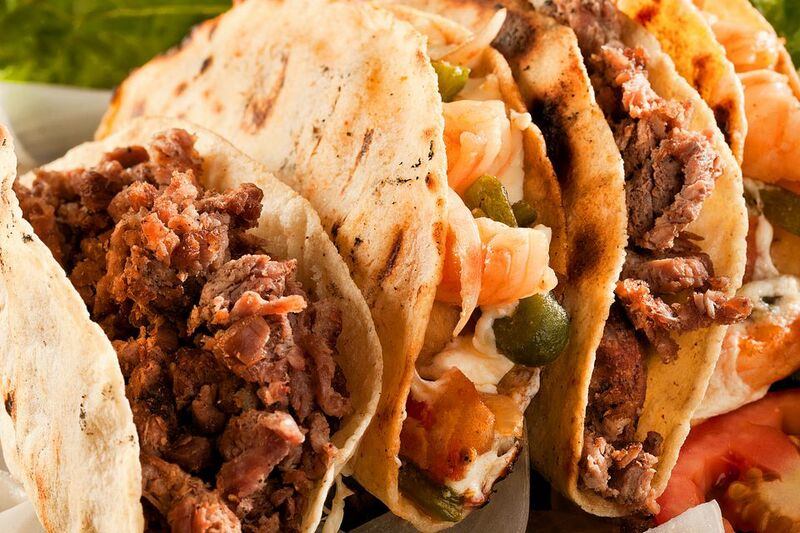 Use picadillo, carnitas, chicken, shrimp, or tuna salad to fill your tacos instead of the beef mixture in this recipe. Trade the cheddar cheese for some other variety, preferably one that melts nicely, since the melty cheese helps to hold these tacos together. Try Mexican manchego or Chihuahua cheese for a slightly more authentic note.